I would say this is good news, and I believe everyone whom has accounts with skype with their phone# recorded will receive similar mail below. Basically you can call skype# then call # anywhere around the world, this could be a big potential money saving for people because some skype countries calling are very cheap and good quality sometime better than land-line, off course now a day technology improved, as you can see public phone booth disappeared and most homes now a day utilizing cell phone as their home phone, and the next generation would be somewhat of utilizing the internet, so in the future basically all you need is an internet connection then your computer turn into a phone free call everywhere. This is an automated email, please don’t reply. Great news: because you’ve registered your mobile number ( xxxxxxx5668 ) with Skype, we’ve set you up with a free Skype To Go number. 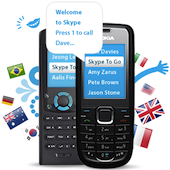 Now you can call your loved ones abroad at Skype’s great rates even when you’re away from your computer. +14843194025 Want a number in a different city or country? 2. Then enter the phone number of the person you’d like to call, starting with the country code (e.g. “001” for the US or “0044” for the UK). Want to register another phone? Enjoy the same rates and use the same Skype Credit as when calling phones using Skype on your computer*. Any subscriptions you have will apply as well. Save your Skype To Go number to your address book so you can make calls over Skype, directly from your mobile. It’s convenient and fast – so give it a try! P.S. Want to save time? You can also set up Direct Dial numbers for your frequently-called contacts. When you call a Direct Dial number you are connected straight through to your contact abroad without any voice prompts. * Your operator’s normal per-minute charges or inclusive plan minutes may apply when calling the local access number. While you cannot reply to this email, you can contact us through our help section for assistance. You can also visit our forums. Skype staff will NEVER ask you for your password via email. The only places you are asked for your password are when you sign in to Skype or on our website if you want to buy something or check your account. You will always sign in via a secure connection, and we ask you to ensure that the address in your browser begins exactly like this https://secure.skype.com It should also show a little padlock symbol to indicate the secure connection. Be alert to emails that request account information or urgent action. Be cautious of websites with irregular addresses or those that offer unofficial Skype downloads. Security updates and product upgrades are made available at www.skype.com or using the client’s upgrade function. Skype Inc., 3210 Porter Drive, Palo Alto, California, 94304, USA. Skype, associated trademarks and logos and the “S” symbol are trademarks of Skype. This entry was posted in Computers, Entertainment, Family, People, Personal, Travel by admin. Bookmark the permalink.